This easy, creamy and irresistible cheese ball is sure to impress any guest! In a medium-sized bowl, beat together cream cheese and sour cream. Add cheese, green onion, Tabasco, Worcestershire sauce and mix well. 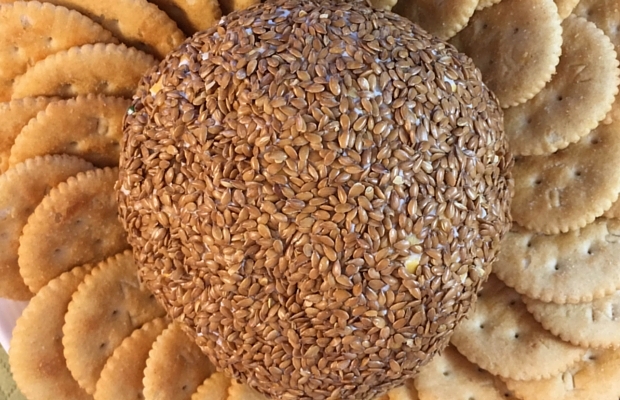 Form into a ball and roll in toasted flaxseed. Wrap with plastic wrap and refrigerate for at least two hours to develop flavours. Serve with crackers and/or vegetables. Serving Size: 1 Tbsp/15 mL. Each serving contains 1/2 tsp (2 mL) of flax.